From origination, it was tested for 45 years until release in 1982. It was selected in 1949 from a progeny of 44 seedlings. During the test period, it was re-propagated several times. I addition to original seedling grown on its own roots, 15 grafted trees were planted into second-test evaluation orchards. Before release, it was identified as New York 49-19. Among the 15 most popular cultivars in the U.S. Stores well. The name incorrectly implies it is a sport of "Cortland" - but it is a seedling and therefore a completely different variety. 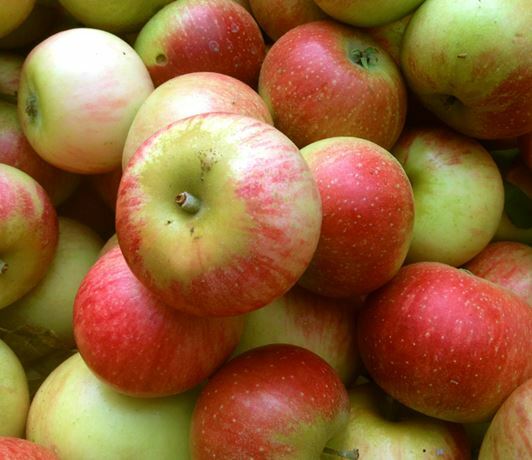 It ripens a month earlier than Cortland, with a distinct striping and more tart flavor. In 1969, marketed in Norway as Mari by Olaf Einset. Comments: Vigorous growth; apples store well.